Visit Delta Force in Dingley for a fun and exciting outdoor activity that everyone will love. 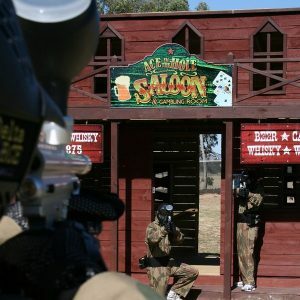 With amazing movie-set game zones and the very best paintball gear in the industry, get your friends together and discover the latest revolution of paintball games to hit Melbourne. Our incredible outdoor paintball centre is easily accessible and we are located only 30 minutes from Melbourne CBD. Experience 10 – 12 action-packed movie-set game zones on your full day of paintball action with the world leader in paintball games. We have years of experience in arranging fun days out for all our customers, which include birthday parties, corporate events, buck’s and hen’s parties, and groups of friends looking to reignite their competitive spirit. All players will be equipped with full head protection goggles, a full-length body suit, body armour to protect the upper torso and an ammunition pack. All of this, in addition to our world-class facilities, will ensure that you have the very best Melbourne paintball experience possible. At Delta Force each player is armed with a 0.68 calibre Inferno Machine Gun, ensuring the scores are level and everyone is on the same playing field. The great thing about paintball is that anyone can play. Those with the better teamwork and strategy will usually be victorious. 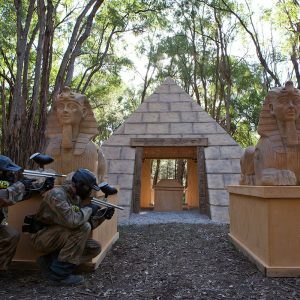 Our Melbourne Paintball centre features game scenarios never before seen on Australian soil, including the signature Delta Force game zone of Tomb Raider. Attempt to capture the ancient relic from the pyramid. Use the giant sphinxes as cover but be careful, as an attack can come from any direction! Paintballers have also raved about our other movie-set scenarios including the Wild West town, Dodge City, Checkpoint Charlie and Chemical Alley. So what are you waiting for? Get your mates together and get ready for the paintball experience of a lifetime. 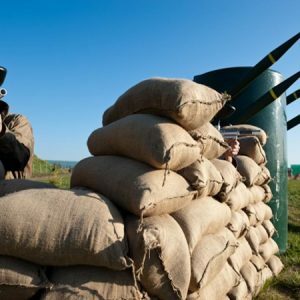 For the best paintballing in Melbourne, round up the troops and contact us today on 1300 850 744.